If ever there was a band that deserves to be thrust into the public’s mind, it is The Stooges. Well, perhaps there are others too, but whatever list you care to compile, The Stooges had better be on it. They are one of the most influential bands ever. Their three proper albums might not have sold very much in their day, critics may not have spent very much time thinking about them. They were seen, indeed they were signed on the basis, as being MC5’s ‘little brother’. But since that date, their reputation has grown and grown. Even when their figurehead, Iggy Pop, has dropped off the culturally relevant map, they have remained an essential touchstone for any band that deserves to be called ‘rock’. 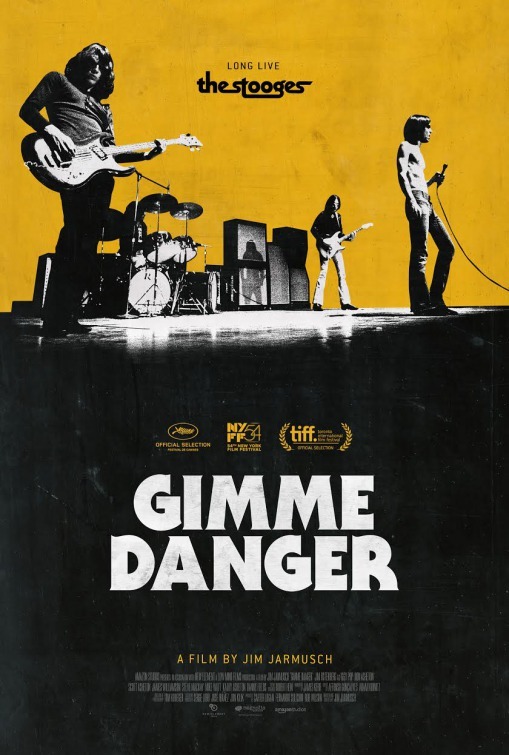 So ‘Gimme Danger’, a documentary directed by Jim Jarmusch (no less), is very welcome. Obviously, front and centre is Jim Osterberg himself. But we have contributions from all the central players, bar Dave Alexander (who sadly passed in 1975); both Asheton brothers, their little sister (! ), Steve Mackay, and James Williamson. It was very nice to see something of the background of Pop and the Asheton brothers. How they came to music. It was fascinating to hear that Iggy had fulfilled his musical apprenticeship in Chicago behind R&B artists. This was a revelation and a helpful one in understanding where the ‘Iggy’ persona came from. It was similarly interesting to see how they began to take themselves seriously as a band, rather than simply 4 guys who really liked to get high. There were also some insights into the personal costs that came from being in a band that required total physical, psychological and pharmaceutical commitment, especially in the period between Fun House (1970) and Raw Power (1973). However, it came across as hagiography. There was little critical assessment. When things went wrong it was someone else, or it was a one off, or it was drugs. Where criticisms were mentioned, they were brushed off. For instance, Iggy recounts that Joey Ramone saw The Stooges during the time of the recording of Fun House and the band plays nothing from the first album and that Ramone thought this disgusting. OK, why? Why does Iggy disagree with Ramone? That would have been an interesting discussion to dig into. The film assumed that the records themselves were unimpeachable. They are great great records – that is not in question – but there was still no sense of where things could have been better or more functional. Given the people involved in these records and the decisions made, there could have been so much more said. John Cale produced the first LP. Where was he? I know that they were not so keen on the mix of the first album, but it was the album that made them and contains some of their iconic tracks. Why not have some discussion of that? Bowie produced Raw Power. Again, there were discussions regarding the mix. But where was he? Bowie was instrumental in reviving Pop’s career, in getting him a new contract, and remained integral to his career deep into the 70s. If we have talking heads footage from Ron Asheton who died in 2009, surely some conversation with Bowie would have been possible – especially since the film was ready by April 2016, suggesting that much of the filming was done in 2015 or earlier – i.e. while Bowie was still alive. All we got was some bitching about Tony DeFries, Bowie’s manager at the time. Finally, the movie pretty much stops in 1973. There is some material about their inauguration into the Rock and Roll Hall of Fame, which is nice, and about how Jay Mascis was involved in getting the band back together, again nice. But there is nothing about the two albums, The Weirdness (2007) and Ready to Die (2013). Truthfully, they are not held in very high esteem, but to remain silent on them seems dishonest. Overall, it is important to give this band their due. They deserve it. Their place in the pantheon is secure and the film gives solid evidence for why. However, it could have been more. I’d certainly recommend it, but not without qualifications.